Knitographical: Newness for the New Year. January's JustB challenge is A Month of Moments. Given the mantra behind by blog (my life in random knitted things) and the overall creative focus of my blog-space, it's not going to be appropriate to do all of these. But I will start out on the right foot. (If you want to play along too all the details are on the photo below or follow the link). I teach a lot of students from Chinese backgrounds and New Year's is very important celebration for them. My husband's family background is Scottish. Again New Year's Eve or Hogmanay is a very important festival. There are a lots of traditions observed for New Year but the common ones across many cultures seem to be feasting or special food and toasting in the New Year and of course fireworks. In the Chinese culture you enter New Year's with a clean house (oops, does clean-ish but tidy count?) and wear new clothes. My middle daughter Mel, and her friend Louise are off on a giant European adventure at Christmas time next year beginning with Christmas in Italy and then wandering through a large part of the rest of Europe. (I know Paris, Amsterdam and London are on the planned itinerary). It's going to be cold; a white Christmas is a distinct possibility, and so Mel has been commissioning a winter accessories wardrobe. (Louise is keeping me entertained with her Europe 2013 Trip Pinterest board of winter coats, scarves and cowls, hats, gloves and other wintery goodness). So in the spirit of New Clothes for New Year, here is the first of them a cable and lace beanie made from some luxurious merino and cashmere wool. It is soooo soft and warm and light to wear! Finished at about 8.30 pm on New Year's Eve. This was really quick knit! I cast on only three days earlier and basically worked on it in the evenings. The knitting underneath is the body of the Arundel jacket I am making for future Doctor daughter which I also sewed up last night. This has stalled. I'm using stash wool and don't have enough for the sleeves. Need a rethink. Cost: Approx $9 per ball. Bought at Clegg's Melbourne City store. Expensive beanie I know. But everyone deserves cashmere at least once in their life. And I don't tend to spoil Mel enough. And because this is a New Year's Post, there has to be New Year's resolutions, Right! Well actually the blog has some New Blog Resolutions. I've learned not to make New Year's resolutions as I am terrible at keeping them. The Blog was reading Pip's Blog School Post on New Blog Resolutions and has been taking an audit of where it's at. I know why the blog exists. I need an outlet for creative me. I know my voice in cyberspace and I'm happy with it. But I do want the blog to reach further and wider. A month of A to Z has helped with that. I have a wild and radical idea. I want to write about what I would like to read about. If I could throw it all in tomorrow, I would like career as a fiber artist; I'm not sure what exactly, knitting and crochet as art in galleries, the world's best yarn bomber or a respected knitting designer. So my plan this year is to interview my favourite knitting designers and creative people and blog regularly about that. Why they do what they do, what got them started, what inspires them, etc... I know this interests me, and I hope it would interest lots of other people too. I've made the first tentative steps in this direction and sent out some feelers. Wish me luck! 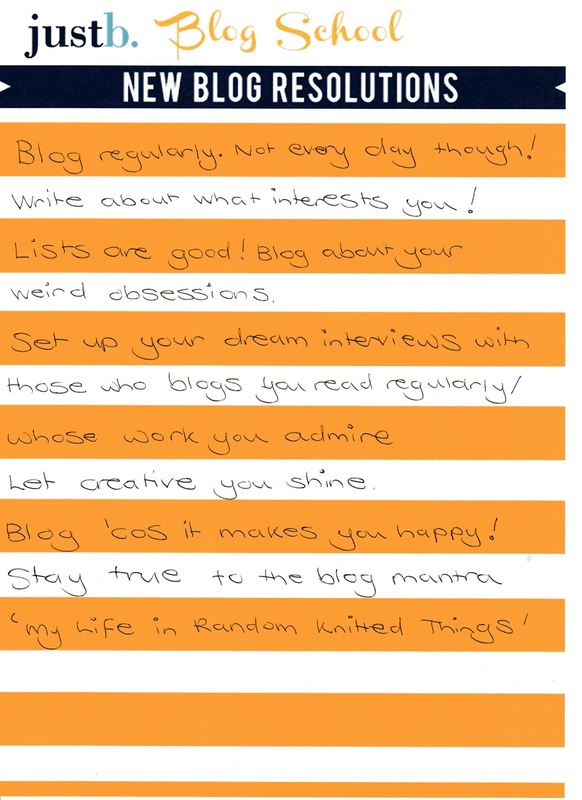 Here's the blog's list of new blog resolutions! Blog regularly. Not every day though! Life won't let you. Be realistic. Write about what interests you! Chances are other people will find it interesting too. (And if not, you had fun writing it). Lists are good. Blog about your weird obsessions. Turn those Pinterest boards into blog posts. Be Brave. Set up your dream interviews with those whose blogs you read regularly and whose work you admire. Find out what makes them tick and share this. 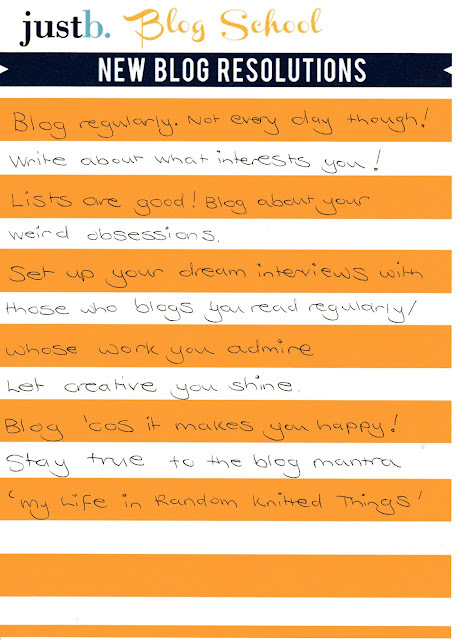 Blog 'cos it makes you happy! Happy New Year and may 2013 be all you need it to be.